I am now firmly convinced that behavioral psychology plays an important role in all public service environments. Therefore, any effort to reform public systems that revolves around regulation and incentives, and overlooks the cognitive challenges, is most likely to be ineffective or certainly less effective than expected. Harassment corruption, or those involving delivery of statutory services (birth registration, caste certificates, water and electricity connections, registering FIR in a police station, property tax assessments, issue of driving license etc), is the commonest form of corruption endured by citizens in any developing country. It is a classic monopoly and therefore most of the discussion to address this has revolved around process re-engineering, competition, transparency, and accountability. An equally important dimension to the problem that has got limited attention is what I call ego depletion due to work over-load. People have a limited quantity of mental resources which they can draw on to exercise self-control and will power, at both individual level and in their inter-personal relationships. Every transaction and decision, of any kind, and its dynamics, uses up mental resources. Let me illustrate. The service standards for a counter clerk in a customer care center in the US mandate that he/she deal with say, 20 customers an hour. Apart from an exceptional day, they deal with no more than that. This provides them the minimum time required to transact without feeling mentally strained. Similarly, a building inspector or police officer or tax assessment official, has all the time and logistics (eg. transportation facilities to inspect the property or crime site) to diligently follow-up on their mandated responsibilities without excessively depleting their mental resources. It provides them the time and mental space to connect with their client/customer, recover themselves, and then go to the next customer. Consider the same official in India. On most days a clerk in a customer care center deals with many times more applicants than can be processed in a cognitively optimal manner. A building inspector services several applications each day, which are geographically widely dispersed, without any logistical support or clerical assistance. Additionally, most often he is entrusted with other unrelated responsibilities. To give a sense of the magnitude of the challenge, New York with 3500 eateries has 180 food inspectors, whereas Hyderabad with similar number of formal eateries and many times that many unregistered eateries (push carts, chai shops etc) has just four food inspectors. Similar spatial, transnational, and functional over-load characterizes all other functionaries, anywhere in India. When people are exposed to the same ego-depletion day-in day-out, without any prospects of improvement even when they move up the ladder, a form of cynical and negative internalization of transnational and inter-personal norms is inevitable. No amount of process re-engineering, while essential, can mitigate this behavioral challenge. The prevailing socio-political environment militates against either higher user fees or increased budgetary support (both of which can presumably be used to improve logistics or effectively outsource certain services) or hire more officials (which undoubtedly has its share of negatives), which are two possible approaches to start thinking about reforms. Informed opinion makers and mainstream debates sweep them under the carpet. Some others who appear to partially get it prefer to argue with homilies like increasing commitment among public officials. Deepening and broadening of capital markets, in particular debt markets, have been at the top of the agenda for developing countries for many years now. But global experience does not appear promising, a throwback to the original sin hypothesis. As can be seen, non-financial businesses form a very small share of total national debt. More prominently, government debt takes up nearly half the share of debt in both India and Brazil, thereby lending credence to the crowding-out hypothesis. 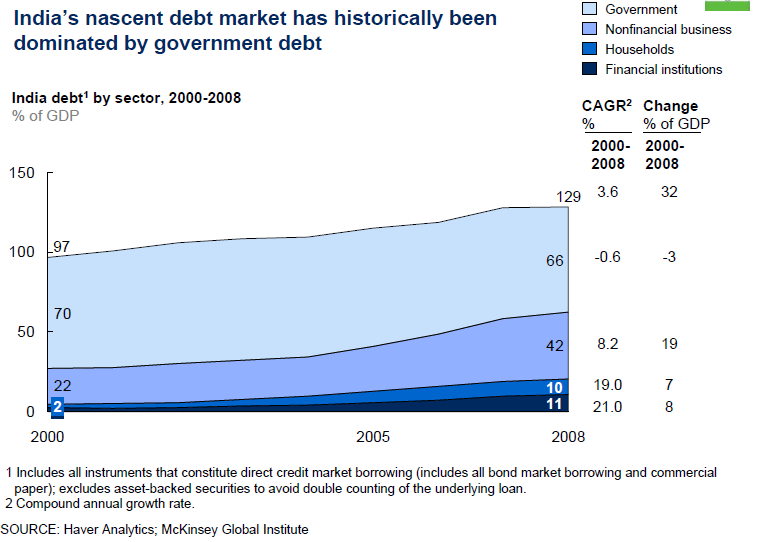 India's non-financial debt market has been growing in recent years, though government dominates the market. 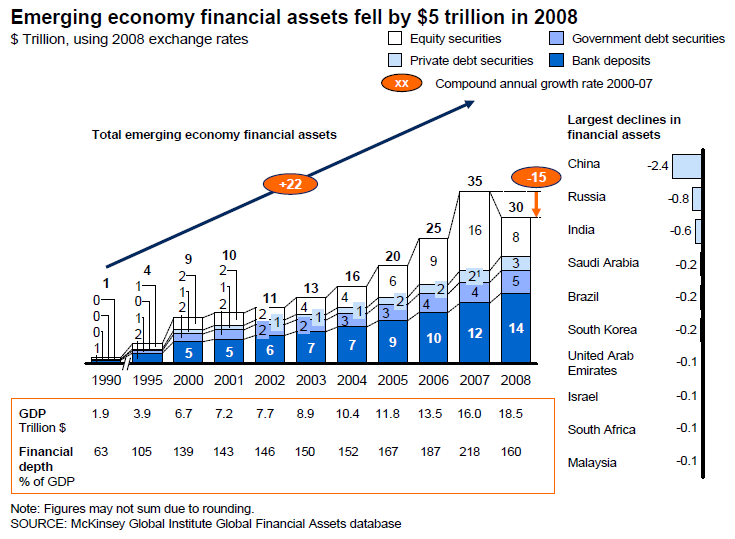 The depth of global financial markets varies widely between developed and developing countries. It is in the range of 400-500% in developed economies, whereas it is in the range of 100-250% in emerging economies. However, in these emerging economies, the share of non-financial corporate debt and securitized loans is minuscule. 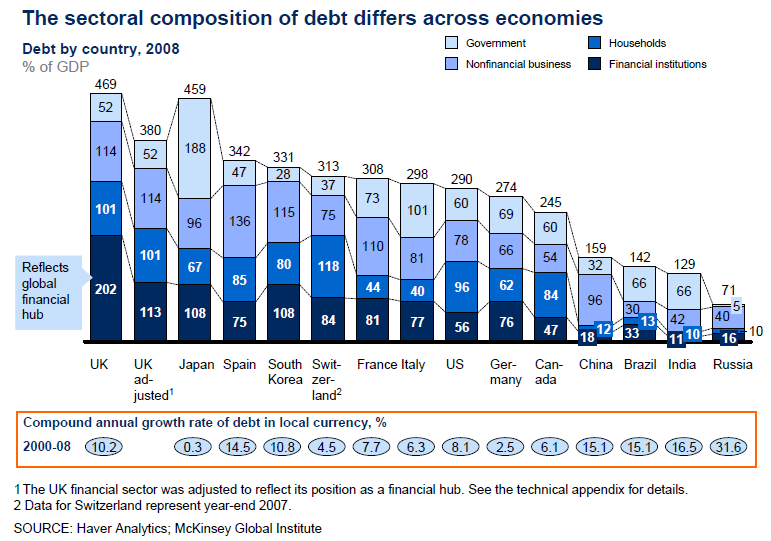 For example in India, of the 42% of non-financial debt, just 4.8% (or 2% of GDP) is held as long-term bonds. It is no different in China, where while non-financial debt forms 96% of GDP, just 4.1% is held as long-term bonds. In fact, even in Latin America where most countries undertook big-bang capital market liberalizing reforms and put in place state of art regulation, non-financial bonds were just 2% of GDP. 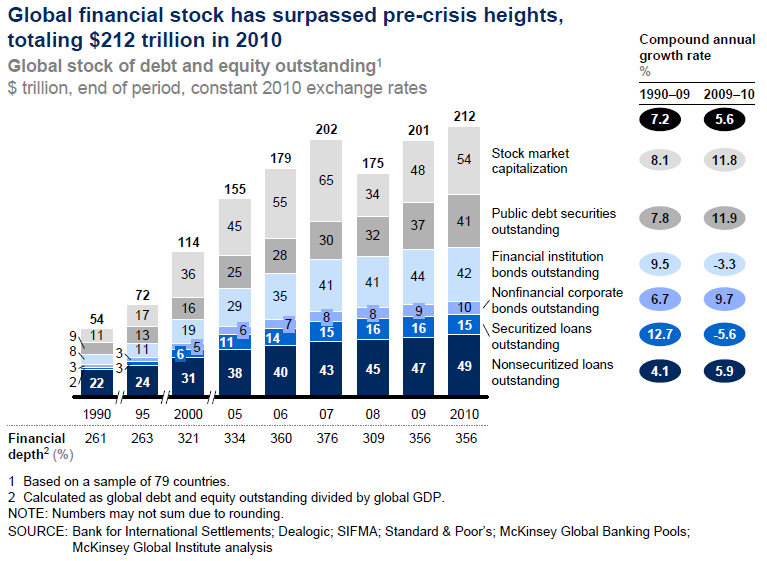 Globally, the rapid growth in financial stock since 2000 has been led by growth in equity markets, public debt securities, and financial institution bonds. The share of non-financial corporate bonds is relatively small and concentrated mostly in US and Europe. 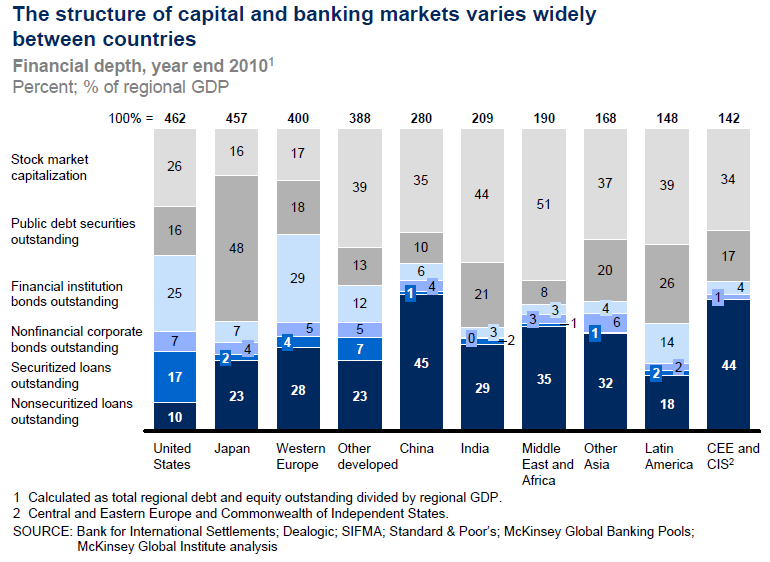 Clearly, as the graphic shows, there is enormous potential for financial markets deepening across developing countries. at 30.8% in 2010-11, just down from 35.8% in 2000-01. In fact, new equity has fallen from 17.2% to 13.8% in the same period. More interestingly, the share of corporate bonds has hardly moved from 3.5% to 3.9%, a far lower than the 17% in China. Despite the wave of financial market liberalization and the resultant surge in capital mobilization, domestic and foreign, private debt securities markets have remained relatively small. 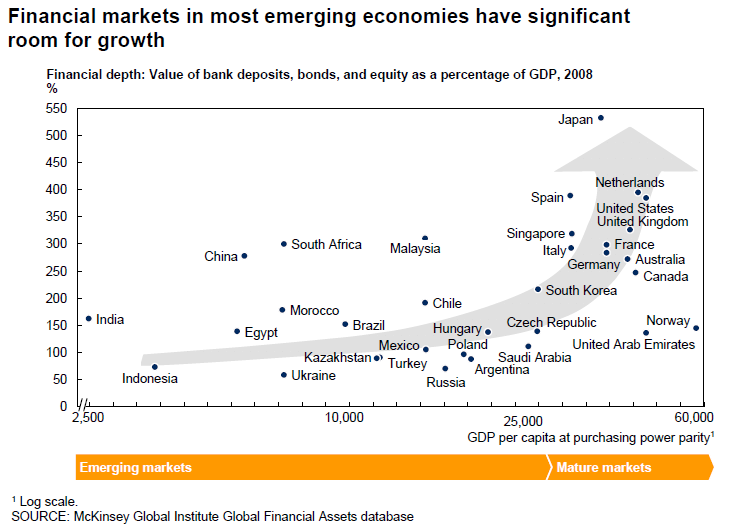 This is stark contrast to the rapid growth in equity markets and bank deposits. In fact, globally too capital markets have remained elusive everywhere except the US. 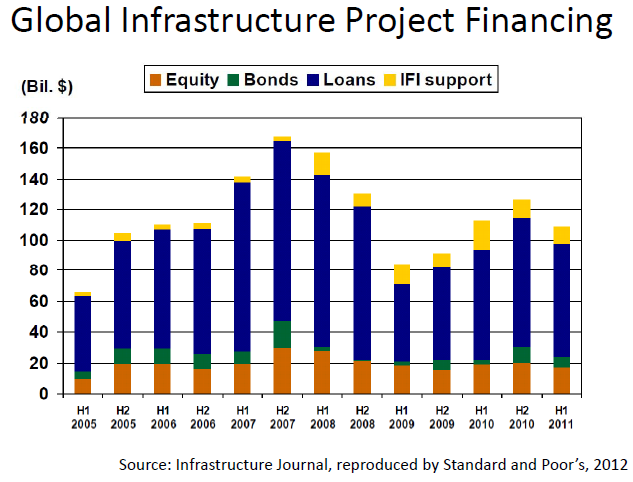 Globally, equity and bank loans have dwarfed long-term bonds as sources of infrastructure finance. This trend is evident across Asia, Europe, Middle East, Africa, and Latin America. Only in US and Canada, do capital markets assume a significant share. Does this mean that the quest for development of long-term bond markets is not a very realistic one? 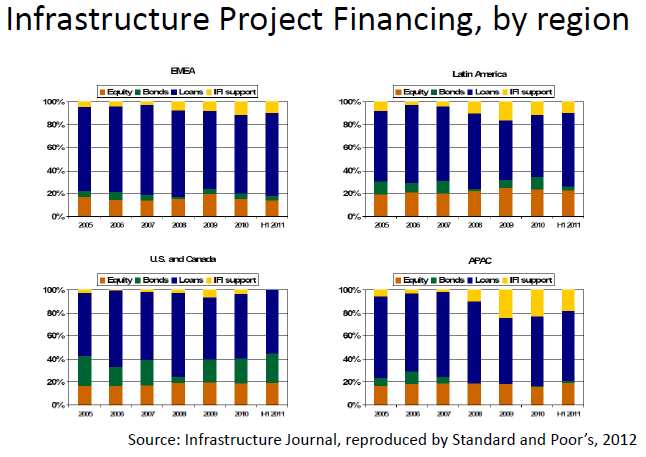 If so, where does the capital for financing infrastructure projects come from? Quartz has two graphics that explain the much discussed Chinese shadow banks. Briefly, the Chinese government caps the interest payable on savings accounts to 3% and impose a very high 20% cash reserve ratio on bank deposits. The former, coupled with capital controls and the lack of alternative investment opportunities for a nation of ultra-high savers, encourages the search for higher yields among savers. The latter, coupled with the search for capital for riskier investments among various market participants, incentivizes the creation of channels to funnel savings that can bypass the formal banking sector. The result has been the growth of intermediaries called trust companies that are not allowed to accept deposits or make loans, but can manage money. These firms have established Wealth Management Products (WMP), which yield higher returns and are marketed by formal banks for a commission. The money raised through WMPs are invested in higher risk projects. Real estate firms, local government entities, and commodity companies have relied heavily on these trusts to raise relatively short-term (2-3 years) capital to finance their aggressive investments. This capital circulation is in the "shadow" in so far as it does not sit on the balance sheets of banks that market them. Neither does it show up on the balance sheets of the end-borrowers too, as they invariably invest in high-risk projects through special purpose vehicles. 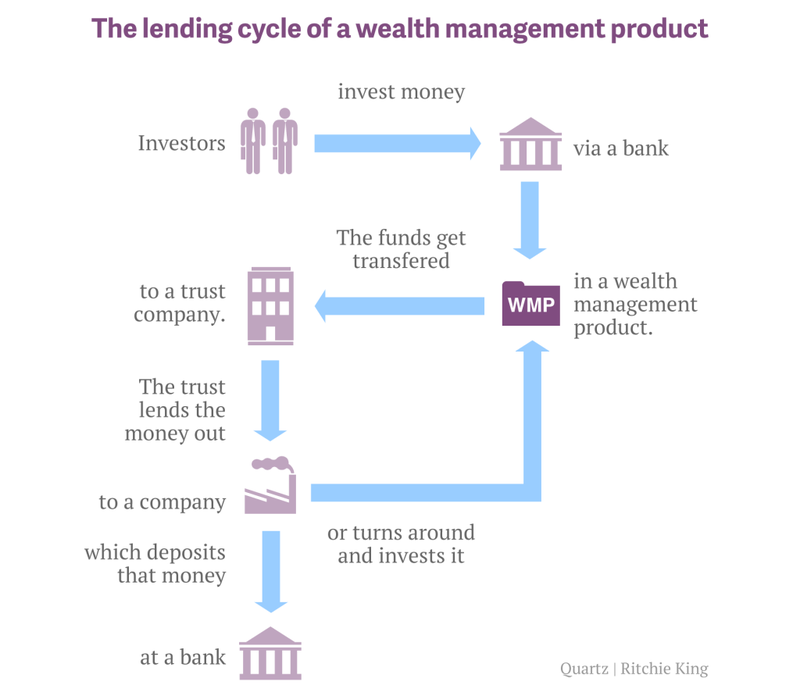 The lending cycle of a typical WMP looks like this. The circulation of capital in the shadow banking system, as highlighted below, generates a much higher money multiplier than with bank lending, leading to excessive credit growth. The problem with such exuberant lending cycles (the value of WMPs have doubled to nearly 10 trillion yuan in two years since Q4 2011) is that they are invariably associated with excessive risk taking. The lending cycle was sustained by the prolonged period of investment driven economic growth, especially fueled by government investments in massive infrastructure projects, which inflated both real estate and commodity bubbles. This naturally exposes the lending counter-parties to the risks posed by declining investments - fall in the underlying real estate and commodity prices. 1. While one could rationally argue, with numbers showing that the share of risk exposure is within manageable limits, nobody can be certain about how things will pan out once a cycle of defaults get triggered. It is almost certain that not even the Chinese government has any idea about the degree of riskiness associated with all the massive investments undertaken by its local governments and real estate firms. 2. Two, till now the Chinese government's ability to impressively manage various emergent challenges has been, in large part, due to the momentum created from rapid economic growth. Rapid growth not only papers over the adverse effects of distortions, but also creates the space for calibrated reforms. And some of the challenges are truly formidable - eg, the transition from the current investment spending of 48% of GDP to a lower path, and the increase of private consumption from an ultra-low 36% of GDP to something more normal like 55-65%. Most importantly, and especially important in an authoritarian polity, growth is often a pre-requisite to contain social and political tensions. On a major new tech project, you can’t really understand the challenges involved until you start trying to build it. Rigid adherence to detailed advance planning amounts to a commitment by everyone involved not to learn anything useful or surprising while doing the actual work. Worse, the illusion that an advance plan can proceed according to schedule can make it harder to catch and fixed errors as early as possible, so as to limit the damage they cause. The need to prevent errors from compounding before they are fixed puts a premium on breaking a project down into small, testable chunks, with progress and plans continuously reviewed and updated. Such a working method, often described as “agile development,” is now standard in large swaths of the commercial tech industry. The larger a tech project is and the more users it will have, the likelier it is that unexpected bugs will surface. And the longer term a technological prediction is, the likelier that it is wrong. A technology plan that tells you what will be happening next week is plausible. One that tells you what will happen next year is far less so. One that tells you what will happen in five years is largely fiction. So thinking of a tech project as something that can be implemented according to a single, fixed plan, with a product that can be delivered in a package at some fixed date long down the road, can be a recipe for disaster. Each step of a tech project’s implementation thus serves three functions. The obvious function is bringing the project further toward completion. But two other functions are also essential: any step in the implementation tests the assumptions that went into the design, and it produces new information that can and should be used to inform planning for the rest of the project. The people who want to be able to procure technology the way they would procure pencils often ignore both of those informative functions. Assuming basic technical competence, the essential management challenge for all large technology projects is the same: how best to balance features, quality, and deadline. When a project cannot meet all three goals simultaneously... something has to give, and management’s job is to decide what. In such cases, if you want certain features at a certain level of quality, you have to move the deadline. If you want overall quality by a certain deadline, you have to simplify, delay, or drop features. And if both the feature list and the deadline are fixed, quality will suffer, and you have to launch and fix after the fact. I think much the same applies to all complicated projects, ones where there are too many "unknown unknowns". They span the full spectrum to running good schools and hospitals to rolling out large transportation projects like a new airport of a mass transit service. The challenge is compounded by the inherent nature of large bureaucracies - with its limited tolerance for failures, impersonal reporting systems, limited operational flexibility, aversion to taking judgment calls, incentive incompatibility of managers, and so on. Navigating this challenge is not easy and explains why many ambitious projects bite the dust. An oft-repeated complaint among bureaucrats is that legislators interfere too much in operational issues like transfers of field functionaries and procurement of goods and services. It is common knowledge that the MP or MLA have strong vested interest in the postings of officials deputed to work in their constituency and the contractors awarded local works or supply orders. Legislators put pressure on officials to violate rules to accommodate these vested interests. It forms a major source of patronage and a channel to keep their loyal followers satisfied. But this interference in routine administrative activities contributes to the politicization of grass-roots administration as well as the erosion of state capability. Why do law-makers end up becoming rule-breakers? The simple answer is that of patronage, corruption, and self-aggrandizement. A more sophisticated answer is that it is a reflection of responsibilities and incentives within the system. The unfortunate reality is that legislators, or law-makers, spend very little time on their primary responsibility of making laws. Though Parliament and Assemblies discuss and legislate laws, much of that work is notional. The major part of the work of preparing legislations is done by the concerned Ministry, at the instance of the ruling coalition. The individual legislators have a very limited role in this process. Apart from their occasional intervention, if any, in the discussions that take place in the legislature when the bill is tabled, the legislator could be nominated to a Parliamentary or Assembly Standing Committee that are sometimes constituted to scrutinize the Bill. Their other statutory responsibility is participation in the activities of the regular legislative committees. A legislator is typically a member of one such committee and his time commitment for this is minimal. Here, the nature of India’s parliamentary democracy differs from that in countries like the US. In the US, legislations are brought forth as private member bills, where a handful of legislators, often cutting across party lines, come together and formulate bills which are then brought before the legislature. While the provision of private members bills exists in India too, it is rarely used as parties front legislations. Accordingly, legislators in US have large office establishment to facilitate the process of preparing legislations. A typical Congressman has an official establishment with 40-60 staff members, the MP in India has to rely on just 1-2 official assistants. The situation is even more perilous with MLAs. In the absence of any support staff, it is extremely difficult for even well-meaning and committed legislators to contribute meaningfully to making laws or even plan for the long-term development of their constituencies. Deprived off any substantial role in their primary role of law making, legislators expend their energies on activities within their constituency. This generates two negative externalities. One is the proclivity to interfere in administrative matters at the district and constituency levels. The other involves competition and conflict with their counterparts in the district, block, and village panchayats. The latter becomes especially pronounced in cases where they belong to different political parties. The turf battles in turn ends up exacerbating the politicization of administration and weakening of public systems. So how do we get Indian legislators to become meaningful participants in the process of development? Critics reflexively blame India's "bloated bureaucracy" for governance failures. So how "bloated" is it? For the most part though, India's relatively backward States have low numbers of public servants... Bihar has just 457.60 per 100,000, Madhya Pradesh 826.47, Uttar Pradesh has 801.67, Orissa 1,191.97 and Chhattisgarh 1,174.62. This is not to suggest there is a causal link between poverty and low levels of public servants: Gujarat has just 826.47 per 100,000 and Punjab 1,263.34. The data could explain, though, why even well-off States like these have found it tough to ensure universal primary education and eradicating poverty. I have always considered this alarming deficiency as an important contributor to our state capability deficit. An illustration of this deficit is that New York with 3500 eateries has 180 food inspectors whereas Hyderabad with atleast a few times more eateries has just 4! Much the same is common across cutting edge activities - school inspectors, outreach nurses, agriculture extension officers, town planning inspectors, engineering supervisors, and so on. It is impossible to systemically deliver effective outcomes when the jurisdiction of the official is massively stretched functionally, geographically, and population-wise. Even a cursory matching of time and task to responsibilities would reveal that we would need to have a few times more functionaries. And, as the report highlights, these deficiencies span across all levels. It is as much incorrect to say that Indian bureaucracy is top heavy as it is to say it bottom heavy. Or overstaffed at the center and understaffed at the states. It is understaffed at all levels. None of this should be taken to presume that once we have them in place, state capability will improve. Far from it. Personnel deployments have to be complemented with other administrative reforms that increase transparency and local accountability, improve supervision and monitoring capacity, build capacity, and prevent the politicization of bureaucratic functioning. None of these are easy. But to mindlessly blame "bloated" bureaucracy for our governance failures will not get us anywhere.